Workers joined protest marches in New York City, Philadelphia, Boston, Raleigh, N.C, and other major U.S. cities, according to union organizers. They said workers would be joining strikes in 150 cities and several countries. Nakiel Clemons went on strike outside Burger King (BKW), where he works in Durham, N.C.
Nakiel is 33 years old and has a one-year-old daughter and a 12-year-old son. He earns $7.45 an hour and said he can't survive on his meager earnings. "I can't worry about my manager seeing me on the strike line, I have to speak out," said Nakiel. In Philadelphia, Justice Wallace, a 19-year-old Subway restaurant worker also marched in the heart of the city. She earns $7.50 an hour and recently joined the National Guard to help supplement her income. "I believe all the companies heard us today and I feel good about that," said Wallace, who has a two-year-old daughter. In New York, Luis Vasquez took a break to talk to CNNMoney outside a Domino's Pizza (DPZ), where strikers gathered for a midday rally. Vasquez is 19 years old and works at a Chipotle (CMG) outlet in Grand Central Station earning $9 an hour. He is the main source of income for his family, which collects food stamps and takes government help to "pay the rent." A high school graduate, Vasquez started going to college, but had to drop out because "work got in the way." 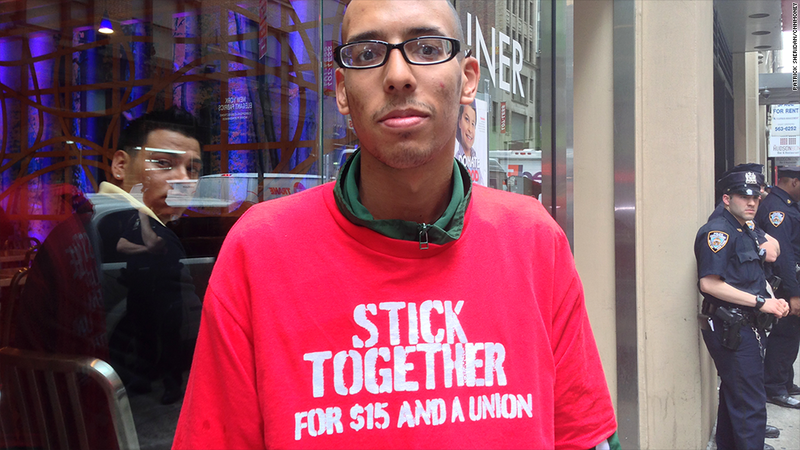 Luis Vasquez, earning $9 an hour at Chipotle, joined the protests in New York. "What I am trying to say to companies today is share the profit ... We are not asking for cars or fancy vacations, we just want to feed our families," said Vasquez. Workers and labor activists marched in Tokyo earlier in the day. 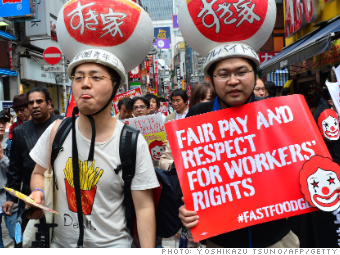 Currently, the median pay for fast-food workers is just over $9 an hour, or about $18,500 a year. That's roughly $4,500 lower than the Census Bureau's poverty threshold level of $23,000 for a family of four. 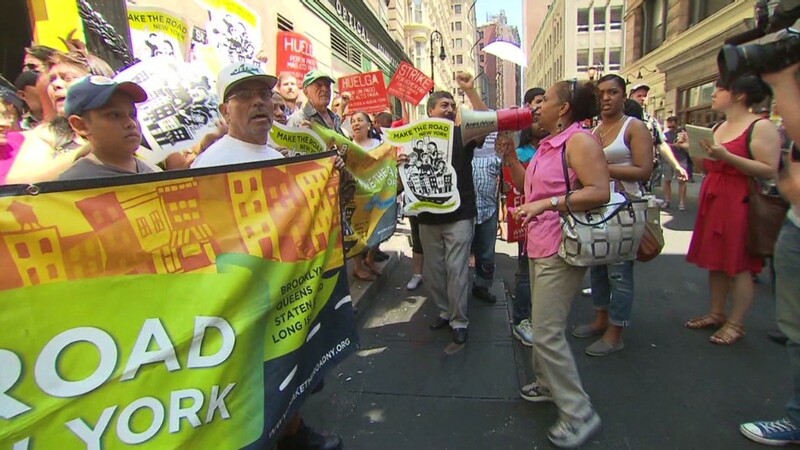 The "Fight for $15" campaign started in New York in November 2012, when 200 fast-food workers demanded $15 and the right to form a union without retaliation. Union organizers say the movement has elevated the debate about inequality in the U.S. and helped raise the minimum wage in some states. The movement in its current leg has also gone global. There were reports of protest marches in Tokyo, Seoul and London.